The Goliath Frogs are the biggest frogs in the world. They are as big as a house cat! Children in some African countries treat this frog like a pet dog or a pet cat. They can grow up to 13 inches (33 cm). When their legs are stretched out, they are about 3 feet long (90 cm) and can weigh as much as a newborn baby. They are about 3kg (6.6 lb). Unfortunately, the population of these frogs is declining because they are hunted for food and to be sold as pets, and their habitat is being destroyed. Conservation efforts have been carried out to protect the frogs by putting them in zoos. But they do not breed or survive well in captivity. The only real hope for them to survive is to make sure that humans protect them in the wild and don’t exploit them. Because they are classified as endangered, the Equatorial Guinean government has declared that no more than 300 Goliath Frogs may be taken out of the country per year. Goliath Frogs can be found in the fast flowing rivers with sandy bottoms in the West African countries of Cameroon and Equatorial Guinea. Rivers like this can be found in dense rainforest and are usually are clear. The water has a lot of oxygen. The area around these rivers are usually very humid and hot. The top of the frog is greenish brown and its underside is yellowish-orange. It has rough skin. Because of its large size, it has to eat a lot. It is a carnivore, mainly eating insects, crabs, fish and smaller frogs. On the other hand, tadpoles only eat plants. It can live up to 15 years. It is a mighty jumper. It can leap up up to 10 feet (3 metres) in one bounce. So, it is not easy to capture! It has fully webbed toes which make it a great swimmer in the rushing river. 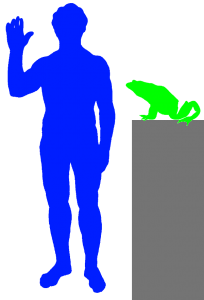 Goliath Frogs are mute. They do not make any noise but they are good listeners. Female Goliath Frogs lay several hundred eggs which are attached to plants growing on the bottom of the rivers where they live. Once the eggs are hatched, it will take about 85 to 95 days for the tadpoles to develop. Although they are huge as an adult, their eggs and tadpoles are about the same size as those of other frogs.